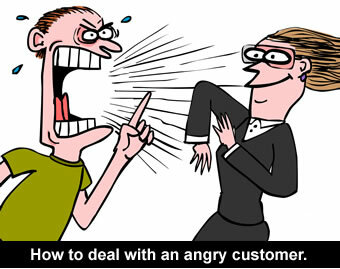 ​How to Deal With an Angry Person - Something New Everyday! In my life, I have found myself many a time having to deal with an angry individual; sometimes I was that individual. These situations often begin with one side feeling slighted in some way, and in most cases, the angry person is simply expressing frustration and is looking for a solution. I have decided to adopt clinical psychologist Dr. Albert J. Bernstein's 7-step method to dealing with an angry person and found it to be very effective. I would now love to share it with you, and hopefully, give you a way to diffuse an unpleasant situation in the future. It's bad enough when one person loses their calm, but when two people do – the situation can become explosive. Angry people often cannot separate their emotions from the discussion, thus preventing it from being resolved in a manner that is satisfactory to both sides. By remaining calm and collected, you're more ly to help the other person calm down as well. Once both of you are calm, a reasonable discussion can resume. If you have a hard time staying calm, go with the old cliché – hold your breath and count to ten. You wouldn't shout at a child throwing a tantrum, you would simply ignore them, and an adult shouldn't be any different. People expect to be able to reason with the angry individual, but it doesn't work for children, and it won't work with an adult. Just let them get it all out until they can calm themselves down. 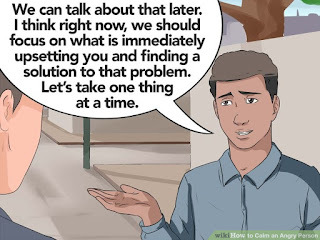 Step #3: Ask them to Slow Down so That You Can HelpWhen a person is at the point where they're shouting and screaming, simply telling them to stop doesn't work. It's even more ly to exacerbate the situation. Instead, ask the individual to speak slower so you can help them. A slower conversation is a calmer one, and letting them know you want to help will contribute to them feeling validated, allowing you to continue with the discussion. Step #4: Ask "What Would You Me to Do?" Once the situation has calmed down, continue the conversation in a manner that will not cause things to heat up again. Asking the other person "What would you me to do?" gives them room to express themselves and feel validated. This, in turn, provides you with the advantage of knowing what the other person wants from you, and allows you to lead the conversation from there. In a conflict, trying to explain something to the other party can often be misconstrued as "fighting back", instead of informing the other person what your reasoning was. In some cases, if the other person realizes that, through your explanation, they were wrong, it can make them even more defensive. Instead of saying "I did something because of…", ask them "Why do you think I did something?" 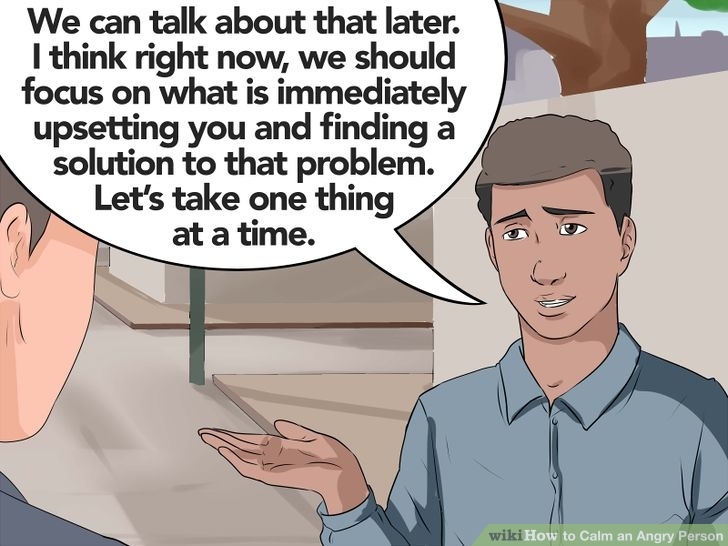 Step #6: Start Sentences with "I'd …" instead of "You Are…"
Once you and the other person managed to resume a rational discussion, the worst thing you can do is make them feel you're accusing them of something. Construct your statements to focus on yourself, rather than on them, and how you can contribute to resolving the problem. This way, the both of you are working on a resolution, rather than on who started it. Once you've reached an understanding, let the other party have the last word. The reason behind this is to avoid saying anything that may be interpreted as an accusation, rekindling the flames. Your goal is to end the conflict and to reach an agreement and to have the last word rarely gets you there. Keep your cool and ignore the little things. Let the other side feel they won while you concentrate on your achievement.